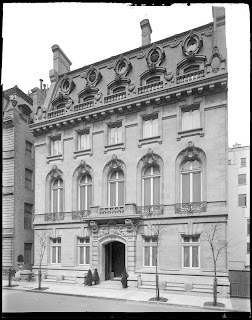 The Marshall Orme Wilson residence designed by Warren & Wetmore c. 1903 at 3 East 64th Street in New York City. Wilson, eldest son of banker Richard T. Wilson, was married to Caroline Astor, sister of J.J. Astor IV. Following Caroline's death in 1948 the residence became the home of the Indian Consulate. Click HERE to see the Wilson residence on google street view. Photo from the Museum of the City of New York. The Wilsons appreciated good architecture, that is certain. When I took a picture of this mansion a few years ago I unintentionally scared the Indian chaffeur at the door. Being it is the Indian Consulate, there are cameras. Quick stats: first floor had twin Reception Rooms flanking entrance, a Salon and a large Dining Room and huge Pantry in rear. Second floor had a front Library and Reception Room, Salon, and a rear Ballroom. The third and fourth floors held 6 and 7 bedrooms respectively with a light court . Mansard bulls eye dormers of course for servants. As is well known, the Wilson siblings were known as 'The Marrying Wilsons' for their many good marriages. The architecture of their houses show how well their parents groomed them for fashionable society---extremely elegant. DED...you forgot to add the link. It's a bad habit of impending age.